I am a frustrated traveller at heart; I never took a gap year as a student and as a result I feel like I have in some way missed out on a necessary life experience. I know this is probably very silly as I’ve got to do and see many wonderful things over the years, but I now find myself inexplicably drawn to travel literature. So imagine my joy when I discovered Spices and Spandex – an epicurean adventure down the length of the world on a hungry stomach by Tom Perkins. Part travel journal, part cook book and part photo diary all rolled in to one – it is now a permanent fixture on my coffee table. To give you a brief synopsis of the book, Tom and his mate cycle, yes cycle, from a tiny rural village in southern England all the way to the leafy suburbs of Cape Town. Crossing a total of 26 countries and 20,000km this 501 day odyssey sees them encountering the most amazing people and tasting some extraordinary food; which Tom shares in the guise of beautifully descriptive recipes. Think hairy bikers, only 20 years younger and without the aid of an engine. 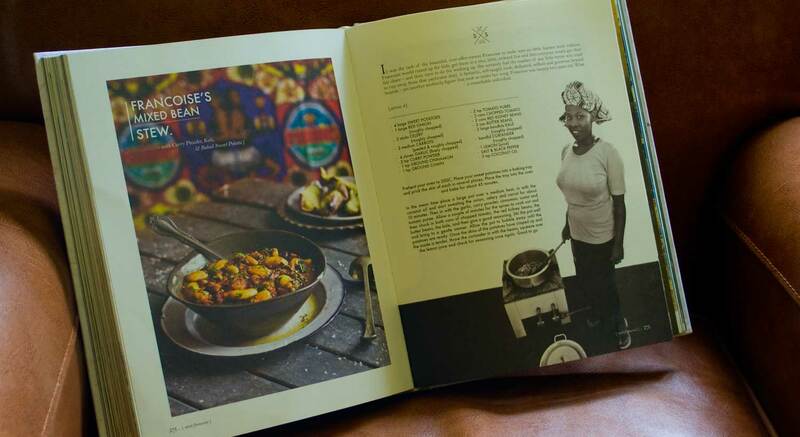 Every recipe tells a story and represents a stage of their Herculean journey, it is pure joy from start to finish. Let me share just a few of my favourite recipes but there are far too many to mention in just one post. Let’s start with a Croatian dish of Bisevo beef pašticada with prunes, dried figs and gnocchi. This is their national dish and a celebratory affair; pašticada is the Croatian’s answer to the slow-cooked pot roasts we are more familiar with. Sticky, sweet slow cooked beef, sweetened by the addition of the prunes and dessert wine; it really is comforting to the max. Though, I wouldn’t advise trying to cycle anywhere after a plate of this! On their travels through Rwanda they visited the Kinamba Project, which helps provide educational opportunities for the people in the Kinamba area of Kigali. As well as providing a much needed education, the foundation is able to provide the children and older students with two mugs of porridge and a full lunch every weekday. It’s a simple objective but very important as the vast majority of Rwandans still live hand-to-mouth. One of the self-taught cooks they met, Francoise, shares her recipe for Mixed bean stew with curry powder, kale and baked sweet potato. This is packed with so much flavour you don’t notice the absence of meat, the spicing is delicate and clever, it makes for a wonderful mid-week meal. Another dish that makes me hungry just by looking at the photo is the Zanzibar crayfish curry with coconut, coriander, fenugreek and tamarind. It takes a little bit of effort to make but the result is so worth it. The crayfish is grilled over a barbecue and the curry sauce that is served with it complements the sweet, delicate meat to perfection. I need to make this right now!